This procedure demonstrates how to replace an empty staple cartridge on a Sharp copier/printer/scanner. Namely the MX-SCX1 staples found in the finishers on the new Sharp advanced and essential series(models listed below). Pull down lightly on the green tab to release the staple cartridge. Note: the cartridge will not be available to grab until it is completely empty. There is no sensor to tell you when it’s getting low on staples, so if you do a lot of stapling it’s a good idea to have a spare set. You can order them from us. Skelton Business Equipment is a Gold Certified Premier Sharp dealer, the #1 Sharp copier dealer in Houston. We are a service oriented company who strive to meet every expectation of our customers and business partners. 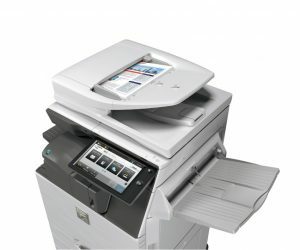 If you’re looking to replace and old Xerox, Konica Minolta, or Canon copier, you should consider an award-winning Sharp. The customization of the 10.1 inch touch screen display makes the Sharps very simple to operate! Contact us today. The External Finisher MX FN29 uses the ar-sc2 as its main staples The manual says it also uses the MX-SCX1 staples. But unable to find location of the staples. Unless it is a misprint. The MX-FN29 is a saddle stitch finisher and it uses the ARSC2 staples. Check out page 124-127 in this manual for instructions on replacing the cartridges.